Prevention of dental disease is the key to keeping your teeth for a lifetime. Our continuous care program, tailored to individual need, starts as soon as treatment begins. Our goal is always optimal dental health. We believe that the only way to achieve that consistently is to set high standards of care and insist on regular visits with our dental hygienist. To take care of your teeth, brush your teeth at least twice a day, preferably after every meal, and remember to floss afterward. Seeing us regularly is critical for maintaining healthy teeth and gums, in addition to keeping cavities and periodontal disease in check. We often can detect other problems before they actually cause a surprise problem. Regularly scheduled appointments for dental recare, are a must. At the time of your recare visit, please advise our Appointment Coordinator of any changes in your overall health, any medications you are taking, marital status, address, telephone number, employment or insurance change. 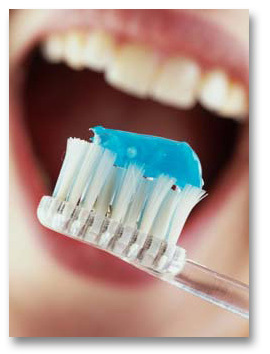 Place your brush at a 45 degree angle to your teeth, and use a short back-and-forth motion to clean your teeth. Make sure you clean the inside of your teeth, your tongue, and the teeth in the back of your mouth. Replace your brush when the bristles fray. That will be about every 6 weeks to 3 months. When you floss, gently ease the floss between your teeth and gumline. Then form a "C" against the side of the tooth, and gently rub the floss from the gumline to the top of the tooth. Remember to floss the backsides of your teeth. If you have a bridge, be sure to floss the teeth around it. Ask us about prescription-strength fluoride rinses and treatments. Fluoride is just as effective at keeping teeth and gums healthy in older adults as it is in children and adolescents.